The itas support desk staff are there for you, busy all day with enquiries coming through on the telephone or by email. They aim to solve every query the same day, and a Power BI Dashboard on the wall registers every query coming in with the ‘time to solve’ against it. 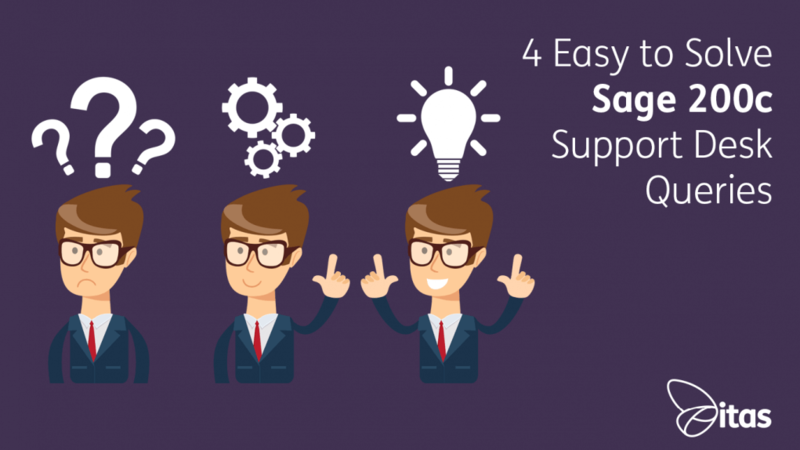 Here are four, easy to solve support desk queries that our support team is regularly asked to assist with. Sage says a user is accessing a module but they are logged off. Have you tried to run a regular Sage 200c routine, or tried to access a feature, only to get an error message similar to this one? Computers don’t like any processes they are busy with being abruptly ended. These errors can be caused by a connection loss to the server or the user’s PC crashing. Either way, it’s completely normal and a very common problem. In fact, it is considered best practice to regularly check for and disconnect any disconnected logins as part of your housekeeping exercise. We know your first impulse is to grab the phone and call our kind and efficient help-desk for assistance but you can smile proudly – you’ve got this! Step 1: Ensure you are not accessing the feature yourself by checking for any open windows in the grey bar at the bottom of your screen. Or Click the Tools icon, the cog-shaped icon on the top of your screen and select ‘User Login Status’. Click the disconnected user and then ‘Log Off’. There may be more than one; multiple disconnected logons can be deleted at once by holding down the Ctrl key and selecting them all. Email – If you have not entered any email options for the report in Report Designer, this opens your email program for you to set up an email message. The report file will be attached to the email. So chances are your report is sitting in the spooler. Head over there by clicking the little printer icon on the top right of your screen (version dependent). Versions earlier than 2015 click File > Output mode. The Tools iconnext to it, is where you can change the default. Click on Output Mode and select your preferred option. A word of caution on the spooler – it is not a storage facility and should not be considered a safe place to store important documents. If there is something in there which you need to keep safe, save it to your hard drive as usual. You can get this message when the transaction you are enquiring on is not in balance. There are a number of causes for this error. The most likely is batched transactions being allowed on your nominal accounts. When this is enabled a single entry is made in Sage 200c will post to several different URN numbers. The batch will balance but individually they will not so when an enquiry is run on only one of the URNs the error message will show. This is quite normal though and nothing to worry about. The only way to stop this is to untick the batch postings option – on each individual nominal account. Contact your IT department if you have a large number, they will be able to run a SQL script on the back end to fix it in a few seconds! If that is not the cause, then you may have a genuine error caused by a partially posted transaction. First, you need to find it. In the menu go to Accounting System Manager > System Utilities > Balance Ledgers > Financials. 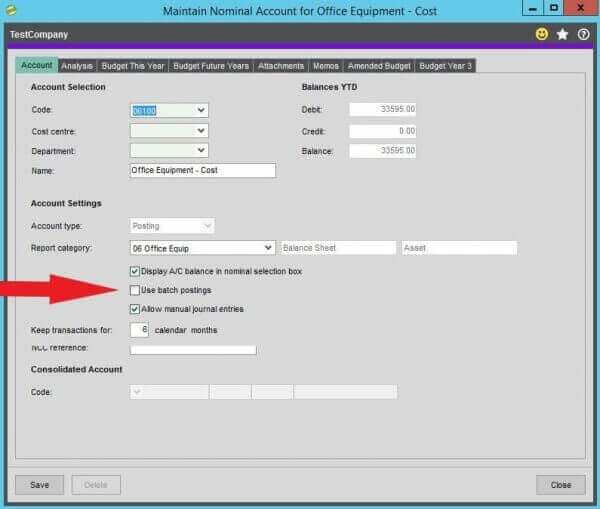 Select the option to run the NOMINAL and click ok. Here is where Sage’s magic happens. Any imbalances will be corrected, with the balancing transaction posted to the suspense account. The log file will show any imbalances and tell you which account is affected and by what amount. You can post a journal to moving the incorrect balance from the suspense account to where it belongs. Run your Trial Balance to check your system is in balance. I can put customers and suppliers on hold, and I can put customer invoices on hold, but can I put purchase invoices on hold? Indeed you can! This one works a little differently though, it must be flagged with a Query. The Query field only takes one character but you can choose any number or letter you wish, all meaning different things to you. In this example, I am using H for Hold. First, flag the purchase invoice you want to put on Hold. In the menu select Purchase Ledger > Purchase Enquiries > Transaction Enquiry. Select the supplier and click in the Query column to type the H. Invoices with queries won’t be included in the payment run but the value will show on the supplier account. NB: The Query process will not reverse, or have any effect, on the nominal or supplier ledger. To pull a report of all the purchase invoices with a query against them, on the menu: Purchase Ledger > Reports > Account Analysis > Transaction Listing (Current). Under the Query Flag option change the field from ‘All’, to ‘Is’ and type a ‘H’ in the blank field. Clicking ok will give you a report showing all Purchase invoices marked with a ‘H’. We hope these tips take you one step further to being a Sage 200c Super User!